Traditional Georgian dish that will make you crave it all over again. Tender chicken is coated in a creamy and extremely flavorful Satsivi. It’s a Walnut Garlic Sauce that is a melt-in-your-mouth, lick-your-fingers delight. If you think that most delicious European food comes from France or Italy, I’m going to pleasantly surprise you today. 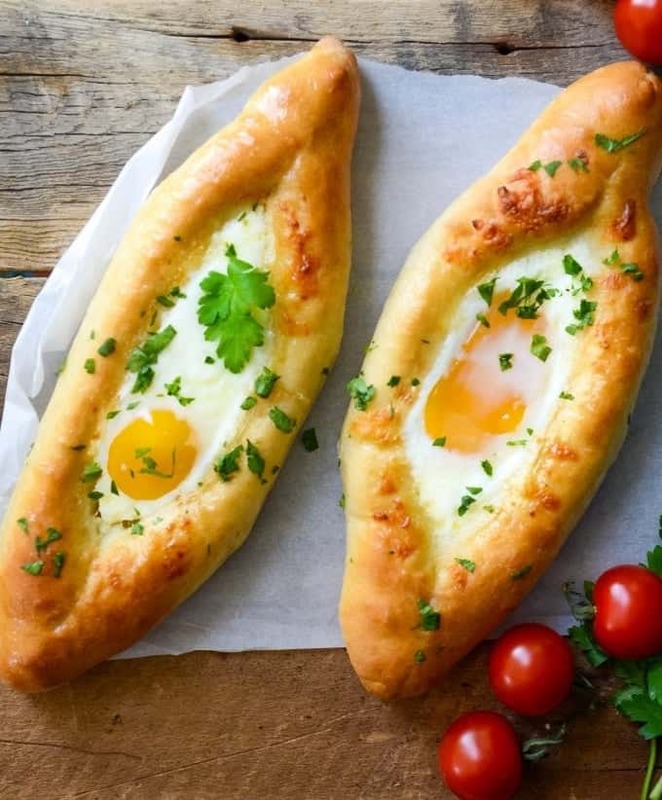 Have you ever heard of Georgian cuisine? Or more importantly, have you ever tried one? I bet you haven’t. 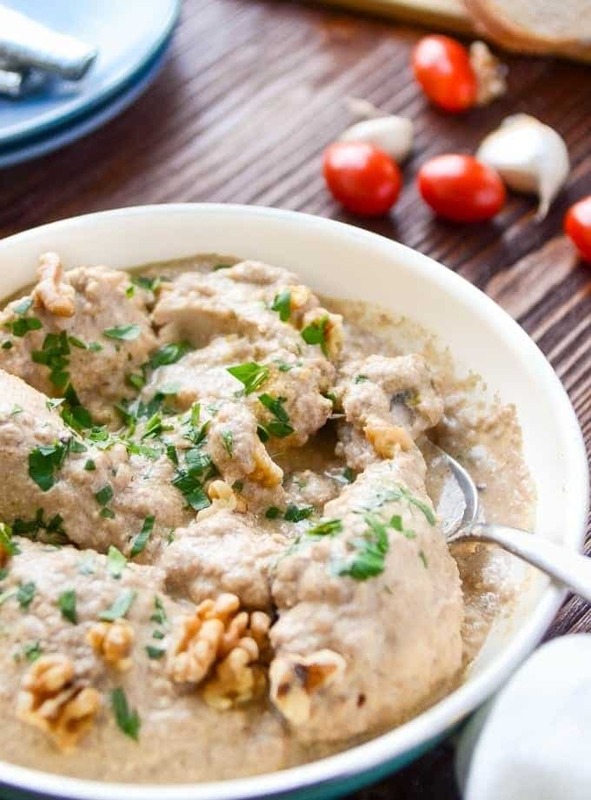 Today, we’re heading to Georgia to try one of the most popular and classic Georgian dishes – Satsivi, or Chicken In A Walnut Garlic Sauce. I have to say, Georgian cuisine has always been one of my favorite. When I lived in Ukraine, Georgian restaurants were all over Kyiv. I remember the time when my husband (then boyfriend) came to Kyiv to visit me, we went to one of the best Georgian restaurants. I think that was his first time trying Georgian food and he absolutely loved it. What distinguishes Georgian food from other famous European cuisines? Georgians love to use sauces and to generously season their food. Their unique combinations of spices are anything but ordinary. These spices are very pungent and add a nice kick of flavor to any dish. Perhaps, one of my favorite spice mix is Khmeli-Suneli. It’s a combination of fenugreek, red pepper, basil, coriander, turmeric, marjoram and some other herbs. It has a slightly spicy taste and is very fragrant. Georgians love using Khmeli-Suneli in a variety of their recipes. It’s actually a very popular spice mix across the whole Caucasian region. There are several places where you can buy Khmeli-Suneli. First, if you have a Georgian, Russian or Ukrainian grocery store in the area, this spice mix should be available there. Or, you can also buy Khmeli-Suneli on Amazon. Now, let me tell you a bit about the sauce. Unlike many chicken recipes that are swimming in creamy sauces, this recipe doesn’t have milk or cream or dairy. 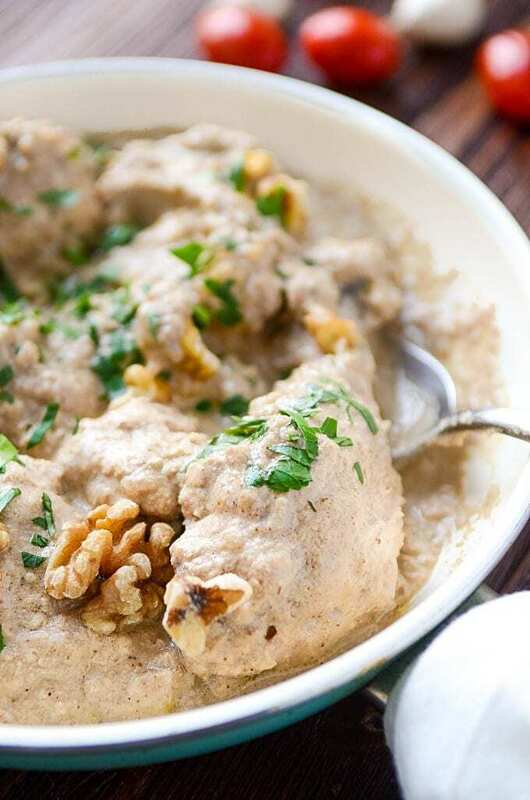 Thanks to the unique combination of Walnuts, Garlic, Chicken Broth and Khmeli-Suneli, it’s totally possible to create a non-dairy creamy-dreamy sauce that you can’t help but eat the last bits of it. This sauce is called Satsivi and you can use it not only for chicken, but also for turkey, fish and vegetables. Satsivi will enrich the taste of even the simplest dishes. Satsivi can be made in advance and stored for 3 days in the airtight container in a fridge. 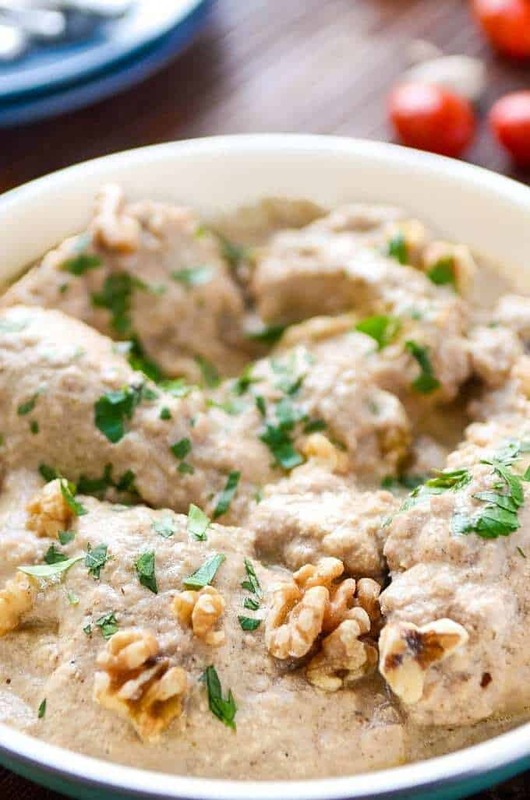 And whenever you’re ready to serve it, just sink your meat into the sauce and enjoy an earthy flavor and incredible taste of this traditional Georgian food. I guarantee, you will absolutely love it! Let me know in the comments below if you’ve ever tried Eastern European food before and if you want to see more recipes like this? Bring a large pot of water to a boil. The pot should fit the whole chicken. Add chicken and boil for a minute. Discard the water, clean the pot, rinse chicken and fill the pot with water again. Add chicken and the ingredients for the chicken broth. Bring water to a boil, then reduce to simmer and cook on a medium-low heat until chicken is cooked through, about 50 minutes. (Don't let the broth to bubble, otherwise it will be cloudy). When chicken is cooked through, transfer it to a cutting board, slightly cool and cut into chunky pieces. Heat olive oil in a medium skillet and over medium heat. Add onion and cook until translucent, about 4-5 minutes. Using a Kitchen Aid grinder attachment, grind walnuts and garlic. You need to do this 2-3 times. Press the mixture against mesh sieve to release the oil. Reserve walnut oil for salad dressings or for other recipes. Add sautéed onions to a walnut garlic mixer and grind again. Now, slowly stir in hot chicken broth, one ladle at a time until your sauce is nice and smooth but slightly runny. You might need to add 4-5 ladles of a broth. Stir in vinegar, coriander, Khmeli-Suneli, cayenne pepper, saffron and cinnamon. Add a sauce in a large sauce-pan and bring to a boil, then reduce heat to medium-low and simmer for 5 minutes. Add chicken to the sauce along with ½ of the chicken broth and simmer stirring occasionally for 15-20 minutes. In the very end, stir in peppercorns, cloves and season with salt and pepper to a taste. If Satsivi sauce came out too thick, add a little bit of broth. Serve Satsivi with a side salad and bread. 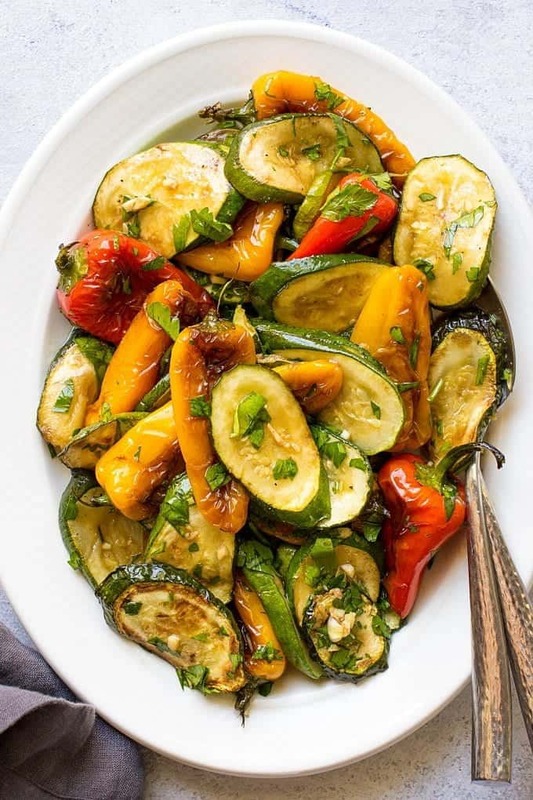 I love this post and would like to add a note… This delicious sauce can also be made with just garlic. If you don’t have an access to Khmeli-suneli, don’t be discouraged! It still tastes absolutely divine with garlic. It will be the closest flavour you can get of Satsivi without the Khmeli-suneli. Kristine, you’re absolutely right! Garlic adds such an amazing flavor that the sauce can totally exist even if Khmeli-Suneli is not available. My ex wife is Macedonian, we used to eat Maco/Balkan food quite often and I loved it! Please do keep sharing recipes like this. I love Balkan food too. I’ve been to several Balkan countries and really enjoyed their cuisine. I’ll take your request into consideration when planning my next recipes. Looks so delicious! I love satsivi. Thank you Gina. This is a really delicious recipe. You will like it! Thank you Julia! Yes, Georgian cuisine is delicious, I wish we had more Georgian restaurants here in America. Satsivi sounds delicious! It’s so fun to learn about new cuisines. Thanks for sharing! This looks fantastic – that sauce is totally calling my name!